DESTIN, Fla. (January 30, 2019) – On Thursday, January 10, The Henderson – a Salamander Beach & Spa Resort – hosted Art Wave, an art exhibition dedicated to celebrating local artists who have art displayed throughout the resort. 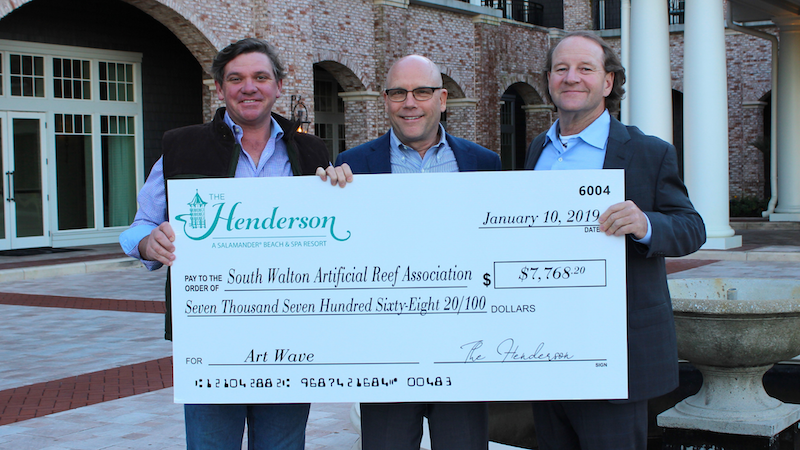 This sophisticated artist’s bazaar raised a total of $7,768.20 for the South Walton Artificial Reef Association (SWARA). Art Wave gave event goers the unique opportunity to view live paintings and mingle with featured local artists, including Jeff Waldorff, John Maher, Justin Gaffrey, Lori Drew, Mary Hong, Melissa Mercer Brown, Russ Gilbert, and Tony Mennillo. The Crystal Ballroom of The Henderson was transformed into an underwater cosmopolitan atmosphere with various balloon installations from Mingle and fresh flowers, lounge seating, and décor provided by Florals by the Sea. All of the featured artists donated one of their prized pieces for the silent auction and some performed live paintings for the audience of attendees. Along with the art each artist had on display, these live paintings were also available for purchase at Art Wave. Guests delighted in the various ocean-themed hors d’oeuvres served by The Henderson, such as Tuna Tar Tar, Seafood Ceviche, and hand-rolled sushi, as well as the featured craft cocktail made with Cathead Vodka. As event goers perused the art and mingled with the local artists, they also grooved to the eclectic beats by DJ 30A and took home snapshots from the commemorative photo booth provided by Epic Photo Co.
Every dollar of the $7,768.20 raised through ticket sales and auction proceeds will be going to the South Walton Artificial Reef Association, a non-profit aimed at the construction, deployment, and monitoring of permitted artificial reefs in Walton County’s Gulf of Mexico coastal waters in order to benefit the underwater habitat and ecosystem. This money will be used for research, various conservation efforts, and furthering the education of reef ecosystems in and around the Emerald Coast.